Eggs are dropping from the sky! Help the farmer catch them, but only the right ones. This tricky game will have you thinking on your feet! To start the game, click "Play." In this game, you'll choose a number and then catch the multiples of that number. A multiple is a number you get when you multiply with a certain number. For example, if you choose two, you'll catch multiples such as two, four, six, eight, and more. 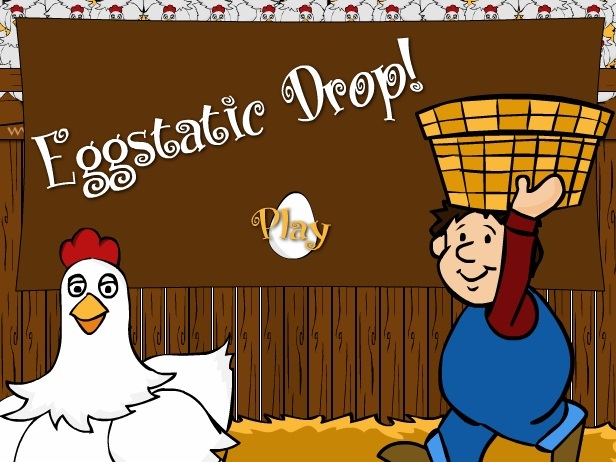 Move the farmer back and forth with the left and right arrow keys to catch eggs with the correct multiples in his basket. In this picture, you need to catch multiples of two, so you'll want to catch the eggs with eighteen and twenty on them. Catch as many of the eggs as you can! Click "Play Again?" to start the game over.